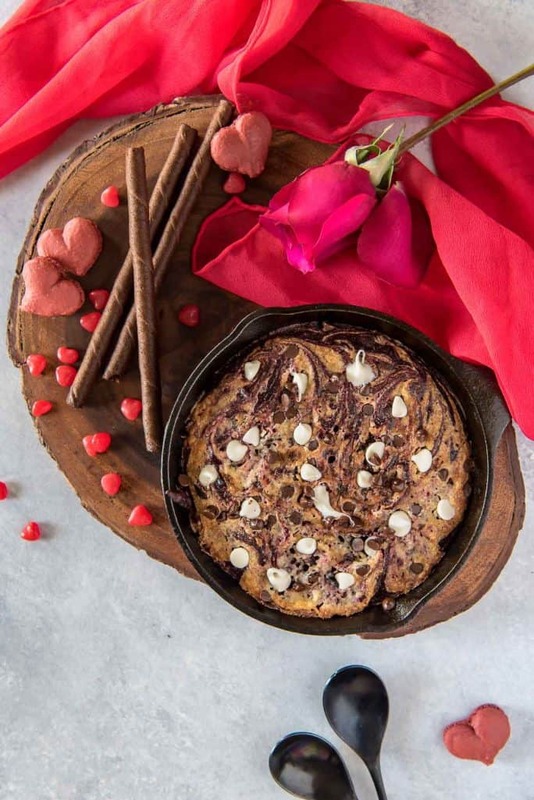 A perfectly romantic treat in a perfectly sized pan, these Red Velvet Swirl Skillet Brownies for Two should be on every special occasion menu! 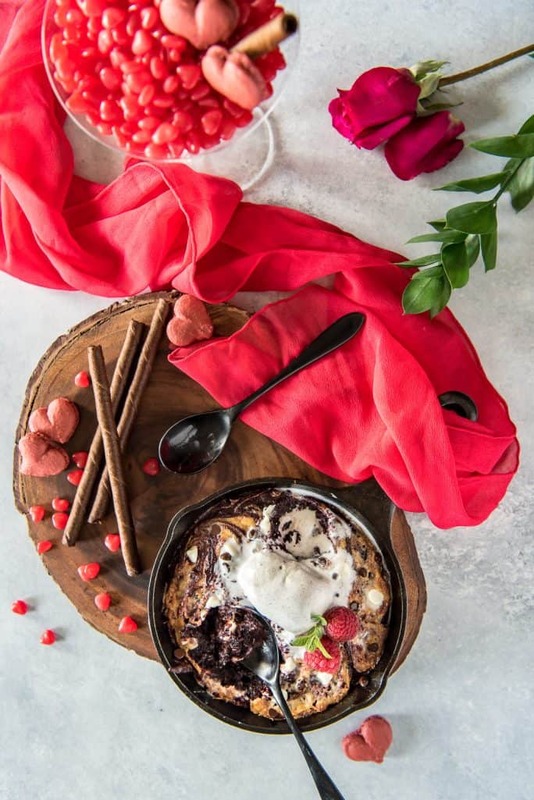 No box mix is required to make perfectly gooey red velvet brownies swirled with a sweetened mascarpone cheese, then studded with dark and white chocolate chips. 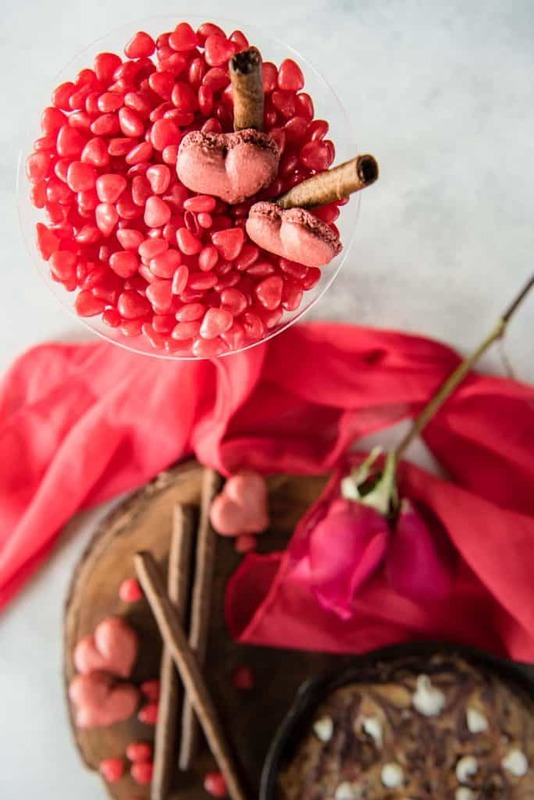 No matter how I feel about today’s holiday, I’ll never say no to a good brownie – or multiple brownies – even if they’re all red & lovey-dovey. That’s a situation that easily gets a little squirrely since, before you know it, half the pan is gone. And after you wake up from the sugar coma, you realize you’re still the only one home so…oops? No dinner for you. For, like, the next 3 nights. HashtagCalorieOverload. Thank goodness for adorably small cast iron skillets and scaled down “brownies for two” recipes. First things first: these brownies are FUDGY. If you’ve come looking for cake-like brownies, let me direct you to a couple of my other brownie recipes. When it comes to brownies, I personally prefer the fudgy kind. Those gooey, chewy, almost underbaked bites are incomparable. Those comfort food cravings are nothing to mess around with. 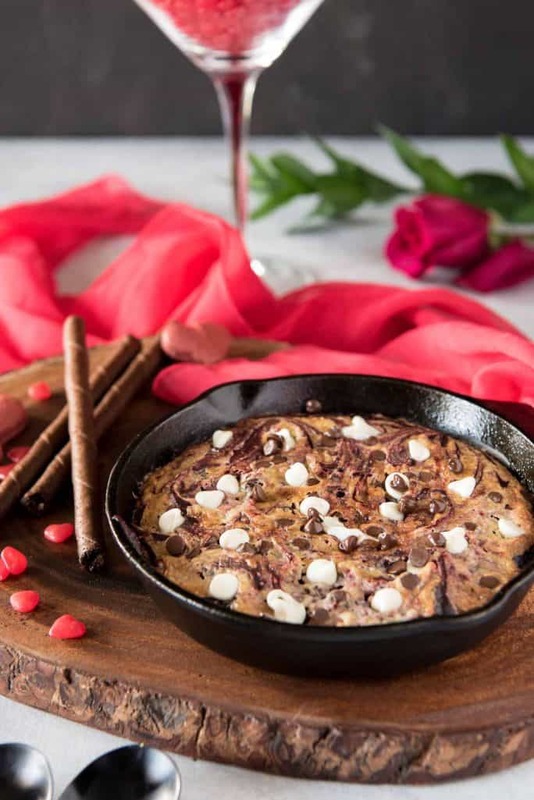 Curling up with skillet brownies, a bottle of wine, and your sweetie any night of the week sounds like a winning date night to me. I’ll admit, the red velvet element to these brownies was a last-minute decision (Valentine’s Day after all). One that required a special trip to the store for food coloring, since I was out. 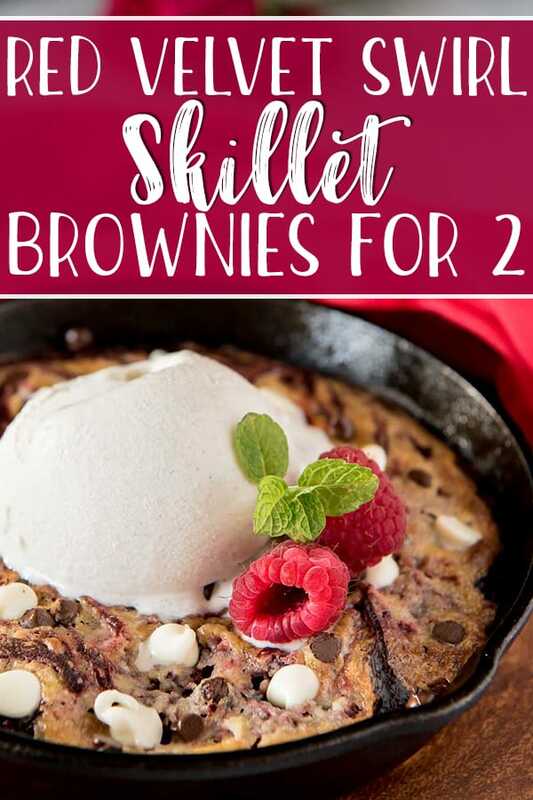 Don’t feel obligated to use it if you don’t have it – I’m pretty confident that these skillet brownies will taste fabulous without any additional color. As far as the swirl goes? Usually, red velvet desserts are paired with cream cheese. Now I am not sophisticated by any means, but if I told you that I only had mascarpone in my fridge…would you judge me as such? I promise this was a first. I usually buy cream cheese in bulk (because food blogger), and mascarpone is a very specific ingredient that doesn’t get too much use in our house. But hot diggity does this swirl pair well with these red velvet brownies. SO WELL. The ice cream is self-explanatory. 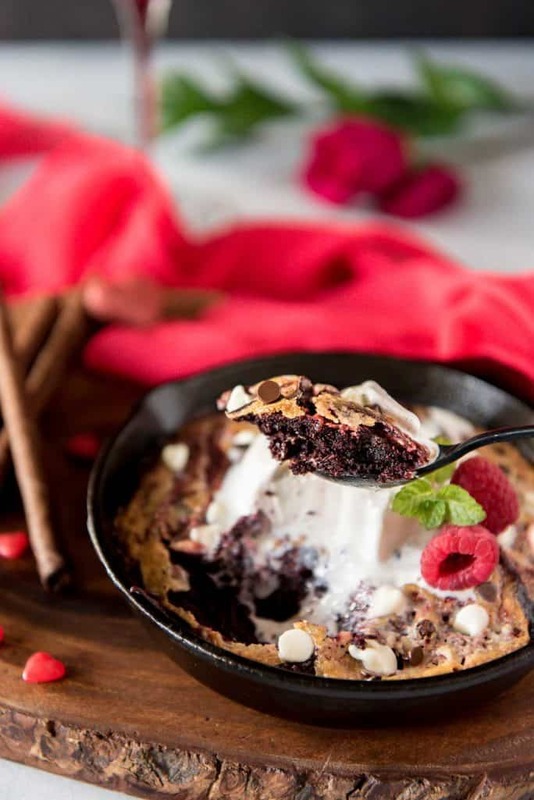 Who eats skillet brownies – in a perfectly good serving vessel – without it? 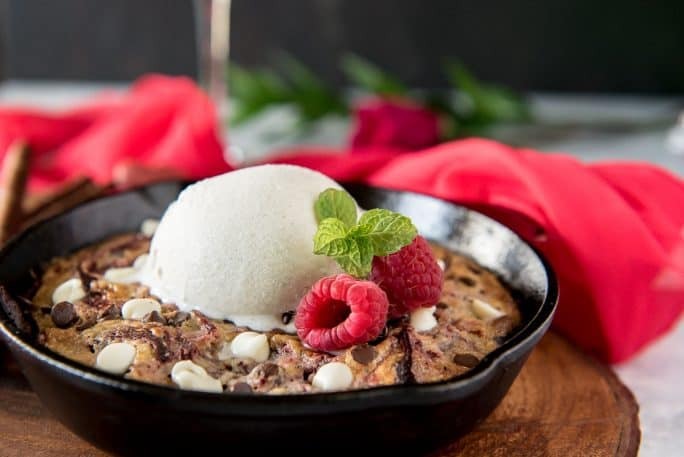 I promise a scoop or two will take this sweet little dessert from ordinary to heart-pounding deliciousness in no time. Here’s to overblown holidays…and still loving the beautiful things about them in spite of (my)yourself. In love with these red velvet swirl brownies? You’re gonna fall for these recipes, too! Preheat oven to 350 degrees. In a medium-sized bowl, whisk together flour, sugar, cocoa powder, and salt. Mix in oil, egg, food coloring, vinegar, and vanilla, whisking until well blended. Fold in chocolate chips. In a separate small bowl, whisk together mascarpone, sugar, and the egg yolk until smooth. 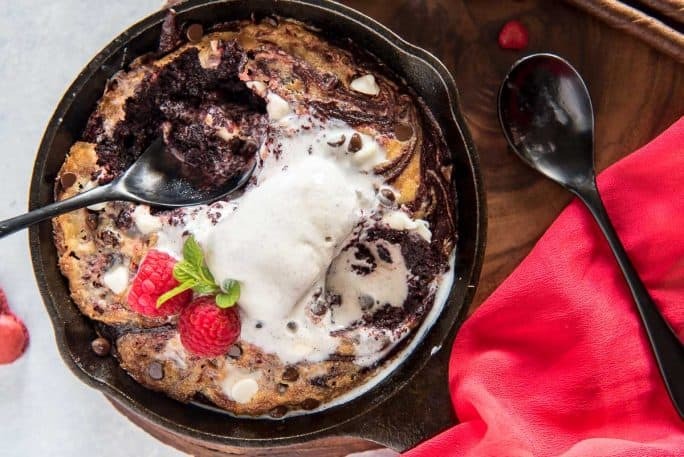 Pour half of the brownie batter into skillet. Dollop half of the mascarpone cream on top, then pour in the remaining brownie batter. Drop spoonfuls on top and swirl them gently through the batter with a skewer or knife. Sprinkle on additional chocolate chips if desired. Bake 24-30 minutes, or until a toothpick inserted in center comes out clean. 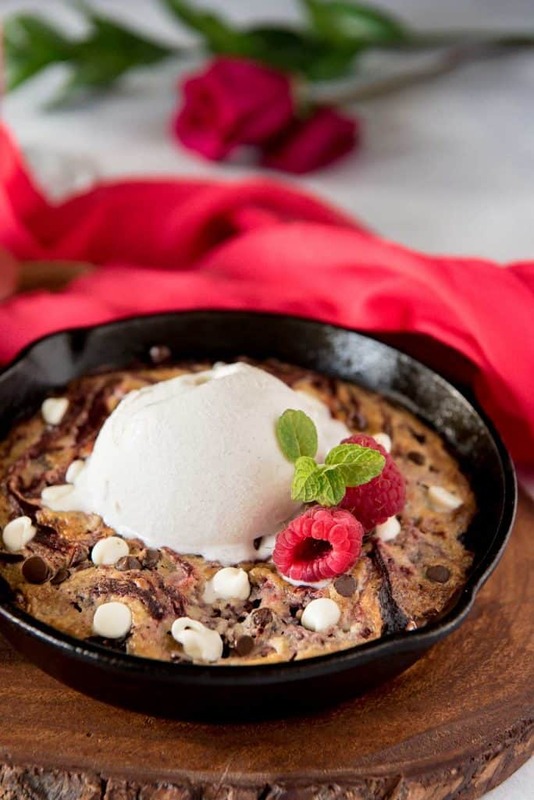 Serve from the skillet, warm or at room temperature, with a scoop of ice cream. 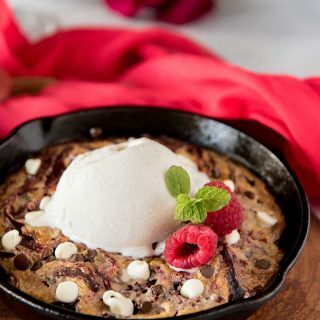 PIN THIS MINI CAST IRON SKILLET BROWNIE RECIPE FOR LATER!